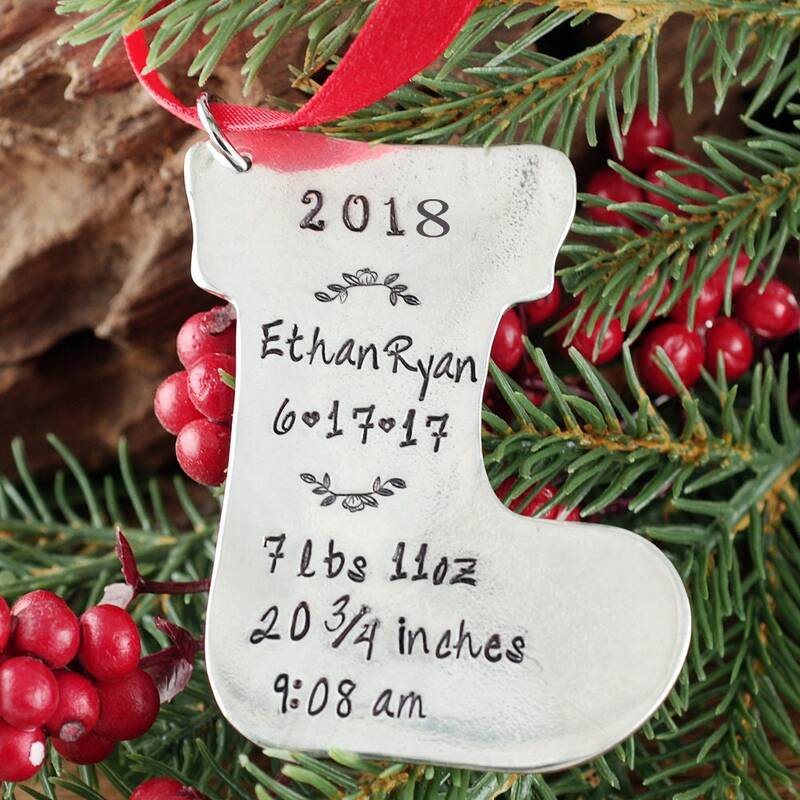 This personalized Christmas ornament is a great gift idea for a new Mom. Our pewter Christmas stocking ornament is made of solid pure pewter and measures 1 7/8" x 2 7/8". Let us know the name you would like stamped on this ornament in our notes to seller box during check out. 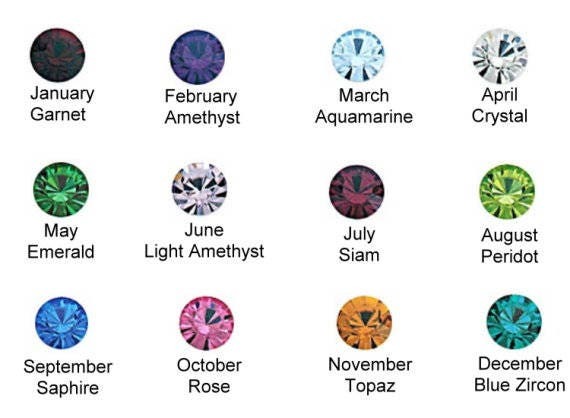 Birthstone Optional - Select option at check out. We can custom design this ornament so if you have a suggestion or request, please convo us or let us know in the note to seller box what you would like personalized on this ornament. I gladly take payments from buyers thru PayPal & all major credit cards. Etsy provides a safe and secure method of online payment. It is not necessary for you to have a PayPal account, and you can use your credit card for payment. Checks are also accepted. Please make payment for your purchases within 24 hours. If you need longer please feel free to contact me and we can work something out. If you have any questions or problems with making payment please let me know so I can try to help! I ship First Class mail USPS unless you purchased Priority Mail or Express delivery. Please note that First Class mail doesn't have a guaranteed delivery time and sometimes takes longer than expected. I do have shipping upgrades available at checkout. Priority Mail ships 3 to 5 days from the date of purchase. Express ships 1 to 2 days from the date of purchase and takes 1 to 2 days to ship. I ship to the address you choose during your Etsy checkout. Please note that I do NOT look at PAYPAL invoices and will not ship to the address on that invoice. I will only ship to the address that is on the Etsy Invoice. Most orders are shipped within 1 to 3 weeks from the date of purchase. This does NOT include shipping time. During the holidays such as Christmas and Mothers day my turn around time can vary and be as long as approx 2 to 3 weeks. Not including shipping time. (BUT CHECK OUT CUT OFF DATES BELOW FOR MOTHER'S DAY) You will be notified of a shipping date through email once your item is designed. BUT PLEASE SEE OUR CUT OFF DATES BELOW: IF YOU ORDER PRIOR TO THE CUT OFF DATE YOU WILL RECEIVE THE ORDER IN TIME. Again - Please read my front page of my site to see all daily updates regarding shipping and production times. I ship anywhere in the US for $5.95. This is First Class mail and usually takes 2-5 days. If you want Priority or Express mail, please select that during checkout. Shipping international is $18.00 shipped First Class from the USPS. You will be responsible for all duty and taxes that are applicable. Please convo or email me prior to ordering to determine a final price. Priority is available for international shipping. Convo me if you are interested in an upgrade. I will accept returns and/or exchanges within 7 days of receipt unless you contact me and we make other arrangements. Before you return or exchange an item, please CONTACT ME FIRST. I will give you instructions as to how and where to ship the item to be returned. I must receive the item in the same condition it was shipped. This means new and unused. NO REFUNDS OR RETURNS ON PERSONALIZED / HAND STAMPED ITEMS. Although if there is an error that I have made, I will absolutely redesign the piece of jewelry and mail it to you. You can return any non-custom piece for store credit, minus shipping costs and a 30% re-stocking fee. for store credit, your non-custom piece must be in its original condition and returned to us within 30 days of its purchase date ( include invoice in return package). please email us at info@anniereh.com to initiate your return. If we agree on a Personalized design being refunded there will also be a 30% restocking fee. Refunds do NOT include shipping FEES. And items will be Refunded within 48 hours. I guarantee that the things I make are of the highest quality. I use the heaviest findings available, and I have very high standards for my craftsmanship. This means that if the item does not stand up to the wear and tear of everyday life, I will repair or replace the item. You need only to cover the cost of shipping to me and I will cover the return shipping. This does not apply to lost items. If you are dissatisfied with an item, please contact me by conversation through Etsy, or email me. I will do all I can to make sure the problem is resolved and you are happy with your purchase. Our current production time is approx 2 weeks from the date of purchase with First Class USPS Shipping. If you need an item sooner please select Priority or Express which will have the product designed and shipped within 1 to 2 days for Express and approx 3 days for Priority. For information about international shipping please see our shop policies. Each piece is hand stamped with a metal stamp and hammer one letter at a time. This makes an impression on each piece. The markings can go through to the back which does not allow us to stamp on the backside. We can always add an extra disc if you need more personalization. Please convo us if you prefer to add more discs. Depending on the item you are thinking of we can possibly use a thicker material to accommodate stamping on the back for you. If this is something you may be interested in Please convo me and explain what you would like along with a link of a design you had in mind. I will reply with in 24 hours with a possible solution or upgrade to accommodate your requests. Personalized Jewelry is NON - REFUNDABLE as it was made especially for you. Although, if there is an error made that i have caused I will immediately correct this problem and ship it out to you. Or if it is something that i have to replace for you I will send you a Pre Paid shipping label for you to mail me the item back. I will then fix the error and immediately mail back to you. If it is NOT our error please convo me and we can figure something out together to see what i can do for you. Sterling Silver, Copper & Brass - always tends to tarnish. Copper & Brass tend to tarnish quicker than most. This is why any design you order with a sterling disc or sterling bracelet or Copper or Brass items... will include a polish pad which I call the "miracle pad" This pad is something you want to keep for a LONG time. It will shine your sterling piece "like new" every time you use it. DONT THROW AWAY. even it is gets black, it can still work. We also sell them in our shop if you need more in the future. To prevent further tarnishing you can always keep the item in a zip loc bag to protect from the air. Avoid showering or swimming with jewelry. If blacking of letters lessen please convo us and we can take care of that for you. Every Necklace will arrives beautifully Packaged in our signature gift box and Tied with Ribbon ready to give as a gift. Each necklace with Sterling and/or copper with include a small 2"x2" white polish pad. DO NOT THROW AWAY. The Polish Pad still works even when used multiple times. We also sell them in our shop. Bangles and most bracelets as well as key chains will arrive in our ivory organza bag. Once you add the link to your cart and go through the process of checking out... You will first select what is needed in our drop down menu. Then you will continue through check out process and You will see a NOTE TO SELLER box. That is where you will leave all information needed. Such as, stamping on discs, birthstones. If I have any questions or concerns regarding your order I will contact you through our ETSY CONVO. If you do not hear from me than everything is ok with your order. PLEASE contact me if there is a problem with your order! I will make every effort to correct the problem. If it is an error on our part " which can happen" we will absolutely fix it for you. If the package is in transit but not getting to you.. please let us know as this happens often but usually arrives with in a few days or a week of that time. Imperfections are not uncommon with handmade. All of our designs are hand stamped. Expect slight variations in stamping/lettering- this is not a defect but adds character and beauty to each piece.